With all the share box related things happening over the last week or so, I realised there are a couple of non-obvious parts of the Android PlusShare class which might be of interest to people. I actually had to test for myself to verify this feature of Google Play Services, which I was aware of but hadn't actually tried! If you are building an app which include Google+ sharing, you might be used to it firing an intent to the Google+ app which gives you the familiar Google+ sharing experience. 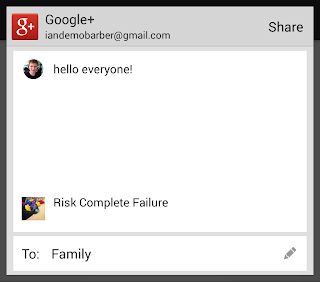 Because the Google+ app comes with many devices, you may not have worried too much about what would happen if it wasn't available, but the Google+ Android platform team did. So they actually built a backup share box right into Google Play Services. You call it just like you would with the regular share box - if Google+ is installed it will be used, otherwise the Google Play Services share box will be handle the intent instead. Its a little bit simpler than the primary share box, but does the job and allows users to share to their Google+ circles even when they don't have the Google+ app installed on their device. Note that the Google Play Services share box only handles the "text/plain" type - so you can't use it to share videos or images! One of the tips in Gus and Joanna's Google I/O best practices talk was to supply some recipients when creating a share, in order to encourage targeted sharing. 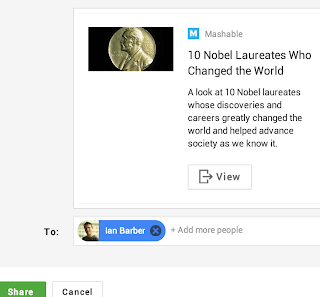 There have been some really interesting uses of that: for example, Mashable use it on the web with interactive posts to encourage conversation by giving you a "discuss" button, then adding the user that shared with you as a recipient.